CALGARY, AB--(Marketwired - July 11, 2016) - Marble Slab Creamery is welcoming Canadians from coast to coast to indulge in their favourite flavours and most-loved mixins, by joining its 2016 National Ice Cream Day celebrations! Head in to a Marble Slab Creamery store on Sunday, July 17 -- the official day of ice cream -- and enjoy Buy-One-Get-One-Free Cone Happy Hour until 1pm and 25% off ice cream cakes all day long. Plus, the first 25 guests that arrive at any Marble Slab Creamery location across Canada on the day, will be treated to a free small cone -- so get there early! The National Ice Cream Day fun doesn't stop there however, with Marble Slab Creamery also inviting ice cream lovers across the country to share their special moments of ice cream happiness! For a chance to win a selection of Marble Slab Creamery goodies, simply upload a photo of your #marbleslabmoments on Facebook, Twitter or Instagram before July 31, 2016*. See here for full contest details: marbleslab.ca/contest. For inspiration of other #marbleslabmoments that have already been shared, including entries such as: "When I was a kid, my dad would always take me to Marble Slab in the summer and we'd both share a banana split! He let me choose two ice cream flavours and I always got the cherry on top! It was great father-daughter bonding time. #marbleslabmoments", visit: marbleslabmoments.ca. National Ice Cream Day has been celebrated since its inaugural year of 1984. Always celebrated on the third Sunday in July, National Ice Cream Day will take place this year on Sunday, July 17, giving Canadians no better opportunity to treat themselves to a bowl, cone, sandwich, sundae or cake of cold, delicious goodness! Did you know that it takes about 50 licks to finish a single scoop ice cream cone and that one in ten people admit to licking the bowl clean after eating ice cream? Well, Marble Slab Creamery knows just what has Canadians licking their dishes. Offering more than a whopping 50 unique, hand-crafted ice cream flavours -- including everything from classics such as double dark chocolate, to exotic flavours like green tea and red velvet -- Canadians still flock to Marble Slab's classic vanilla, which is the top selling flavour in the country! At Marble Slab, ice cream fans can customize their fresh, 100% Canadian dairy ice cream with their choice from 30 delicious mixins and sauces, the most popular being Reese's® Peanut Butter Cups and Skor® bars. With tasty creations like Cotton Candy Circus, Birthday Cake Rocks and Sweet & Salted Caramel, Marble Slab Creamery is constantly surprising consumers with new mixin combinations. Marble Slab Creamery, a leading purveyor of chef-inspired, gourmet hand-mixed ice cream and the innovator of the 'frozen slab' technique, was founded in 1983 in Texas. The Canadian head office and first store opened in Calgary, Alberta in 2003. Today, Marble Slab Creamery has 80 locations across Canada, in British Columbia, Yukon, Alberta, Saskatchewan, Manitoba, Ontario and Nova Scotia. Visit Marble Slab Creamery and experience the happiness of real ice cream made fresh in store. With more than 50 flavours to choose from, ranging from classics like double dark chocolate to exotic flavours like green tea and red velvet, there's a flavour for everyone. Combine it with unlimited mixins such as fruits, nuts, candies, and chocolate, mixed together on the famous 'marble slab' and enjoy it in freshly-baked waffle cones. The possibilities are truly endless! Marble Slab Creamery also serves up gourmet ice cream cakes, ice cream cupcakes, ice cream sandwiches, ice cream pies, sundaes, take-home litres and more. 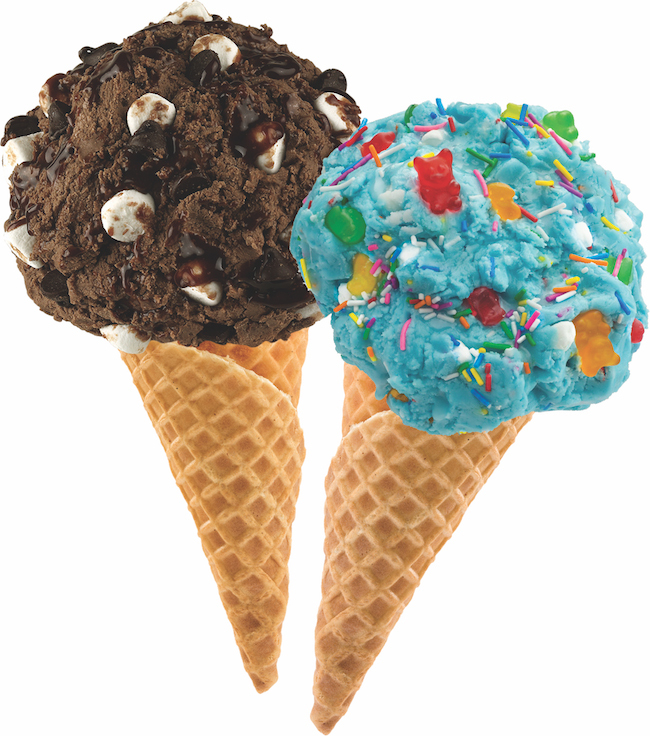 At Marble Slab Creamery, you will experience originality in every scoop!